When it comes to ovens, Neff is a brand that you can trust. Neff ovens are not only durable, they also look great, and with a range of styles and sizes, they will complement any kitchen. Cooking has never been easier when you use a Neff oven. 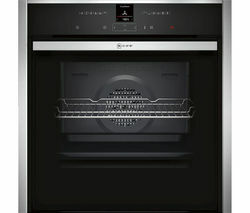 If you like to get creative in the kitchen, why not install a high-end oven to go with your other appliances? Neff ovens are designed for practicality and come with features to help out whether you’re making a Sunday roast or cheese on toast. Neff ovens are dependable, so there’s no need to worry when baking bread and cakes, or when you invite guests over for a big, home cooked meal. 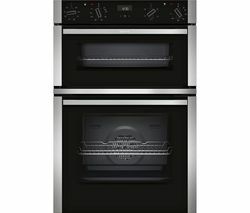 The Neff B57CR22N0B Slid and Hide Electric Oven is a popular model. The unique slide and hide feature means that the door slides out of the way when you open it to give you more room when placing food in the oven or taking it out when it’s done. If you want to take your kitchen set up to the next level a Neff oven is the ideal solution. The NEFF B58VT28N0B features a rapid heat function that can cut down cooking times when you’re in a hurry. Want an oven that's in keeping with the decor of your kitchen? 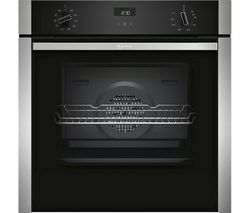 Check out our range of Neff Built In single ovens.